Our Lady of the Woods is blessed to have so many talented, musically inclined people who share their gifts in praising God. Adult Choir - Open to anyone of any skill level! The Adult Choir performs weekly from September to June. Rehearsals are typically on Wednesday evening and Sunday morning before the 9:00 AM Mass. 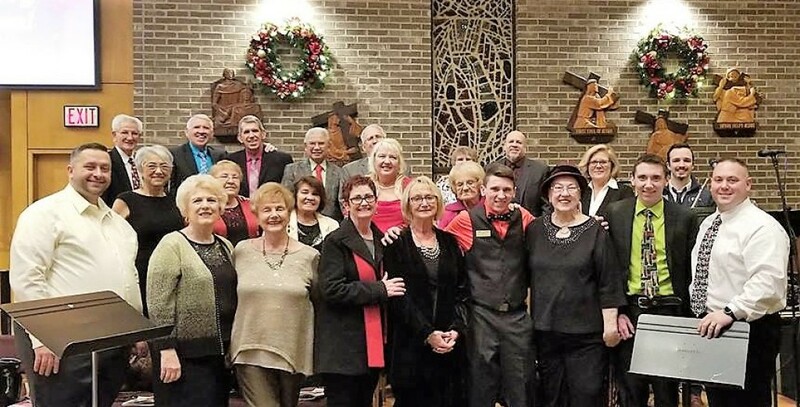 New Spirit Singers - The “New Spirit Singers” are a contemporary Christian music group that began when “Our Lady of the Woods” parish was being formed. The name was chosen by one of the original members on Pentecost back in the 1970’s. Voices in Praise - Voices in Praise is the newest addition to the Music Ministry. An all-male group that formed to provide a mix of classic and contemporary music during Mass, Sean, John, Bob, & Jason are excited to be part of this new ministry. For more information, or if you are interested in joining the Music Ministry in one of the choirs or as an instrumentalist, please contact Bob Amore or Jason Buckley.